Did you know you can now order your Just Eat takeaway from Hai Ha here on View? 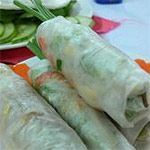 Located in Hackney, Hai Ha offers a great range of authentic Vietnamese fare at very reasonable prices. The delicious food and friendly service makes this a pleasant place to dine. Do you work at Hai Ha? What did you think of Hai Ha? This is a delightful restaurant and well worth a visit. You can bring your own booze which always fantastic especially with an off licence round the corner! from the outside hai ha doesnt look to exciting but once you're sitting down the atmosphere draws you in, and the food is sensational! the staff are also really helpful, and explain some dishes you wont have come across before. this is a real hidden gem! Hai Ha has changed. It looks great since its new re-furb and they have a new chef and menu which is 100% authentic Vietnamese. Had the most amazing meal. The food was truly amazing. The soft shelled crab is a must, the best I have ever had. Just love the new menu. You can take your own wine & beer which is always good, but I was told by the staff that they would soon have a license which will be an added bonus. Cannot wait to go back. Really good value as well. It used to be nice. Got a takeaway today. They told me they'd redone the menu. I'll say. Both dishes a fiver instead of £3.60. Not what I asked for and the portion sizes were half what you'd expect. Buyer beware, don't go there. This Vietnamese fixture of 15 years delivers pretty much everything you want from a neighbourhood restaurant. Okay, so it’s weak on wines and desserts, but Asian places often are, and that’s forgivable when every savoury dish is delicious, prices are reasonable, service willing, and the ambience busy yet relaxed. Hackney has become trendy without shaking off its gritty roots, and this stretch of Mare Street demonstrates the transition perfectly; mid-priced independent restaurants like Hai Ha and attractive pubs jostle with faded convenience stores and fast-food joints. Hai Ha enjoyed a makeover in the summer of 2011, including its menu. It had previously offered a mix of Chinese and Vietnamese cuisine but its owner decided Londoners had become sufficiently enamoured of the latter to drop the Chinese dishes (even if one of the dishes sampled couldn’t have been more retro Chinese-British, but more of that later). The 55-cover restaurant is on a corner site, affording big windows on two sides. The new décor is white, clean and simple with red accents. Tables are well spaced – it was previously something of an elbow-bashing experience - and whilst it still gets a bit sticky on a humid night, air conditioning is promised soon. Even on a Monday night, business is brisk, both eat-in and takeaway. The clientele is classic Nouveau Hackey; so families, couples and groups (both oriental and occidental) of all ages, behaving well and casually but nicely attired. Service is friendly and smiley and generally well-paced, though there’s an inordinate wait for dessert. It could be more proactive – when a sweet and sour dish is ordered, there’s no suggestion that rice, at the very least, will be needed with it. This might partly be because not all the waitresses have unlimited command of English – pointing at the dish sometimes proves the most effective way of ordering it. Dishes arrive as and when, although the starter-main-dessert order is generally adhered to. The menu is changed every six months, it is claimed, which must be a Herculean labour as it's huge. From pages and pages of starters, pork and prawn spring rolls (£4.50) hit the spot, arriving really crisp, piping hot, meaty and prawny. There’s a crisp, undressed side salad which is actually worth eating rather than just being decorative, and a little bowl of typical, thin, slightly sweet dipping sauce. From the familiar to the exotic: frogs’ legs (£7) don’t appear on every menu but here they arrive sizzling on a bed of seared onion and red pepper. They are juicy, tender and, again, deep-fried in the crispest imaginable batter. Nom xoai (£7.50) is a zingily-dressed salad of pleasingly underripe mango, halved prawns, coriander leaves, cucumber and crushed peanuts. Surprisingly, the prawns prove the least necessary and slightly overwhelmed ingredient – it would still be delicious without them. From a truly bewildering array of mains, cac mom tom xao (£7) is a surprise stroll down Memory Lane. It’s sweet and sour king prawns with chunks of onion and other vegetables – even pineapple! – in that bright red, vinegary, sweet sauce we all remember from a thousand takeaways. You’ll wish you’d worn flares and a cheesecloth smock. What it’s doing on a menu that has renounced its Chinese dishes, it’s hard to say, but it’s delicious if you resist the temptation to sneer, and accept it for what it is. Bun mam dam (£7) is a do-it-yourself delight. A plate of vermicelli noodles, salad, crushed peanuts and heavenly marinated, char-grilled pork arrives with a bowl of broth, and you mix it all together. It’s the dish of the night, and that’s saying something. The Vietnamese aren’t big on puddings. There's only a handful of dessert options, of which vanilla ice cream (with or without Baileys liqueur) is unavailable (couldn’t they nip to one of the neighbouring convenience stores and buy a tub and a bottle?). Apple and banana fritters (each £3) are perfectly made – this chef sure knows how to deep-fry – though they cry out for the unavailable vanilla ice cream, or some cream. There’s a tiny and somewhat chaotic wine list (prosecco pops up between pinot grigio and zinfandel rosé) with nothing above £15.50 a bottle apart from champagne at £30. Only one white, one rosé and one red are available by the 125 or 250ml glass which is disappointing these days. At least they’re at the bargain prices of £2.50 for a small glass and £4.50 for a large. The sauvignon blanc isn’t bad with plenty of typical citrus, but the montepulciano abruzzo is humdrum and reminiscent of blackcurrant squash. Bottled beers include delicious, dry Saigon from Vietnam, and there are softs, teas and coffees and, touchingly, just one liqueur: the aforementioned Baileys so, actually, no liqueurs. You could easily eat to a standstill and enjoy a couple of beers (a wiser choice than wine) here for £25 a head. For food this uniformly flavoursome and well made, that’s something of a bargain. In particular, the chef deep-fries and char-grills sublimely. Canny locals keep Hai Ha busy every night of the week but those living elsewhere should definitely consider heading down too.